Today’s kitchen is a multi-functional space used for food storage and preparation, eating, socializing, studying, and more. A well-constructed design is key to making sure the kitchen is not only functional but enhances your day-to-day lifestyle. Despite its many purposes, the heart of the kitchen is still food. Whether you use your kitchen to prepare family meals every day or to cook dinner for friends once a month, the food storage, preparation, and clean up area must be well-arranged and organized. You will find it much simpler to create family dinners or culinary masterpieces when you have a clear work space and know exactly where to find everything. The array of storage accessories available for kitchen remodeling means that every spice jar, cooking utensil, and specialized small appliance can be put away and easily accessible. Cooking ingredients have a special talent for hiding in a disorganized pantry. This can cause frustration at meal time or even make you head to the shop to buy repeats of the same food items hidden away in your kitchen cabinets. Pantries come in all shapes and sizes like the ones shown here, with customized pull-out shelves and racks to keep your food staples organized and easily visible when you need them. Preparing food requires a lot of workspace and ready access to cooking tools to keep mealtime running smoothly. An organized food preparation area means you have plenty of workspace to lay out your ingredients and prepare your meal, since most items can be neatly stored away in a drawer or cabinet shelf when not in use. It also means you know exactly where to find every knife, chopping board, and colander, and can easily access them. 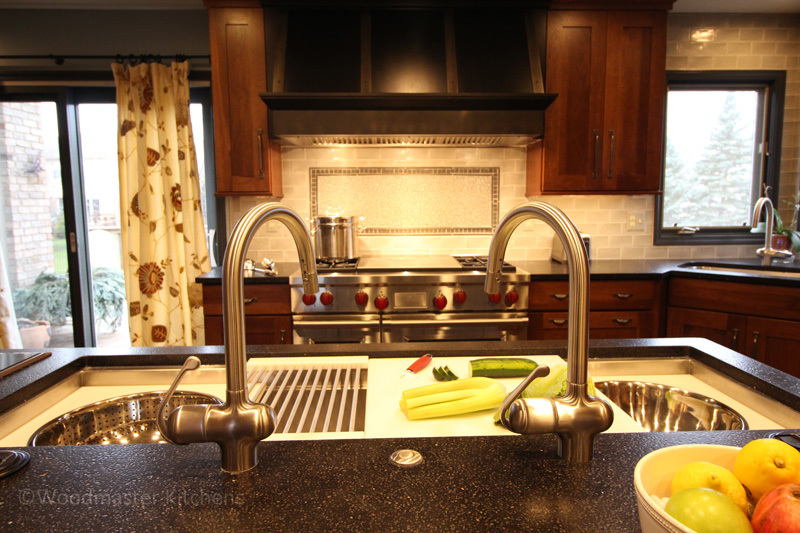 Better yet, if you add a Galley Workstation like this kitchen design in Clinton Township, your chopping board, colander and more will be ready to go at your fingertips. The multi-tiered, super-functional workstation replaces your standard sink and has space for a variety of handy accessories that can be stored in the workstation and accessible when you need them. Contact us or visit us in our showroom so we can tell you more about the Galley Workstation! Getting ready to cook requires more than picking out a recipe and shopping for ingredients. Most mealtimes require an array of pots and pans, not to mention oils and spices. These items present a particular storage challenge as you want them within arm’s reach of the cooking area, but do not want them cluttering your countertops. 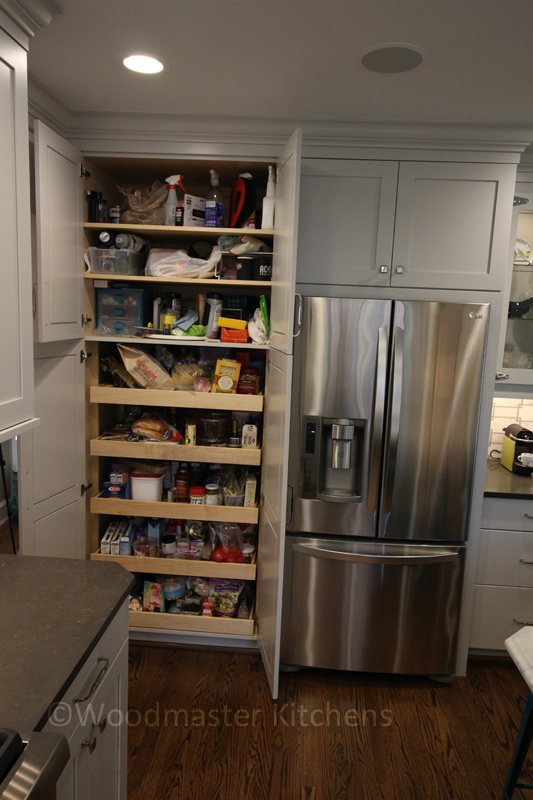 There are so many options for squeezing specialized storage into otherwise unusable small spaces, that there is almost no excuse to leave it out of your kitchen renovation! Add pull out spice racks in the narrow spaces next to the range or oven, or include a spice drawer in your cabinet selections, like the one pictured here. There are many alternatives for storing pots and pans, but one of the best solutions is deep drawers that make them easier to lift in and out like the one shown below. Small appliances can also be put away and accessed when required, by including pull out shelves like the ones shown here or a similar storage accessory. Not many people enjoy the cleanup that follows food preparation, but the right kitchen design can at least make this essential part of any meal easier and faster to complete. A pull out waste bin keeps the trash hidden away but easily accessible when you need it, and you can allow more than one bin to accommodate recycling. If space allows, a second sink or even a second dishwasher in the island makes the cleanup process run more smoothly and mean there is plenty of space for everyone to chip in and help with the cleaning. Do these ideas sound like they would help food preparation run more smoothly in your home? Check out our kitchen design gallery for even more great ideas!